Newborn Dry Fruits to Mumbai In India Gifting Dry Fruits Are Considered As One Of The Caring Gesture. 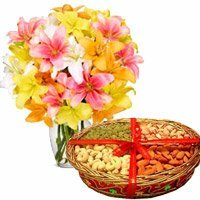 Buy And Send Newborn Dry Fruits To Mumbai With Same Day Delivery. Place your order to send Dry Fruits to Mumbai, Gifts to Mumbai, Cakes to Mumbai, Chocolates to Mumbai, Gifts to Mumbai, Dry Fruits to Mumbai, Send Dry Fruits to Mumbai, Cakes to Mumbai, Deliver Gifts to Mumbai, Deliver Dry Fruits to Mumbai.